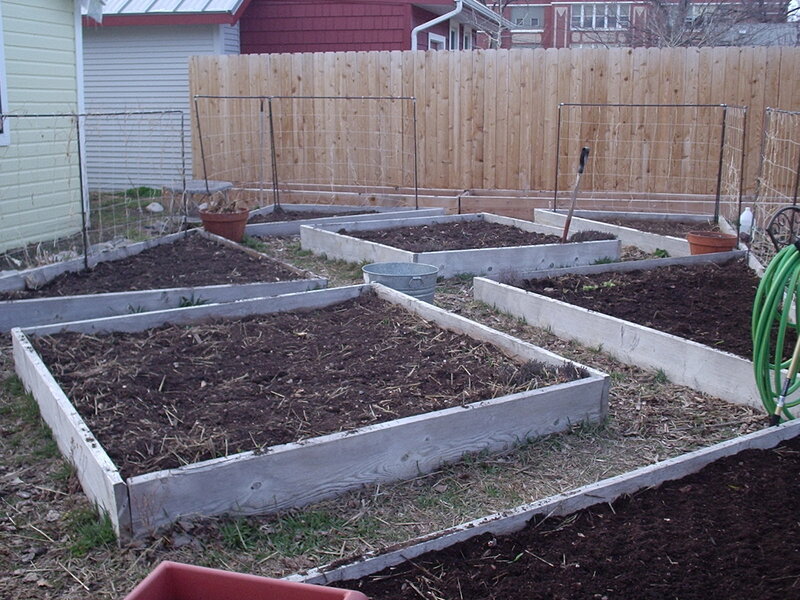 This was my other weekend project — cleaning out the garden beds and turning over the soil. I used straw mulch last year, which was a great success, but it was a seedy batch, and I wound up with a sturdy winter cover crop of wheat. I experimented a couple of months ago with just turning it over. But like the grass that I also have troubles with, it kept coming back. So this weekend I went through each bed, digging out the wheat, and the carcasses of dead vegetables, and turned over the soil, breaking up lumps along the way. It was good solid physical work. It felt good after a long winter inside. And it’s the sort of quiet, repetitive task that gives you time to think about the things going on in your life. The sun was shining, it was warm, I was back in the garden, and all was good. 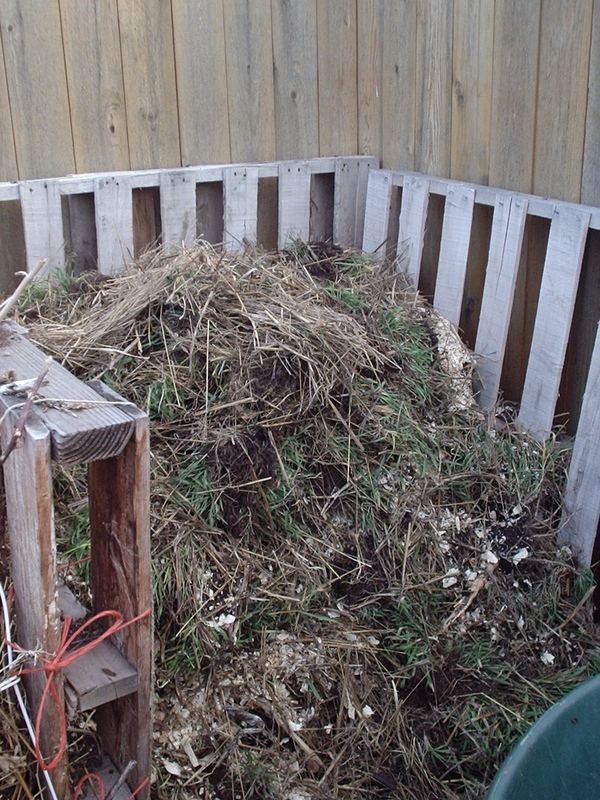 This compost bin was nearly empty when I started pulling wheat sprouts. I think it’s going to make a nice start to the season — by default it’s a pretty good mix of green and brown. We’ll see — maybe it’ll heat up. But it was a good weekend of real work. And now I’m ready to start planting. How do you keep your dogs out of your compost pile? My dog, who leaves everything else in the yard and garden alone, seems to think the compost pile is her personal toy box! I think I’m going to have to buy a closed bin this year. I’ve had the same experience with straw. It seems that farmers make more on their straw bale harvest than they do on the grain so they don’t bother harvesting the grain anymore. Sad, but true. And have you noticed how expensive straw is anymore?! Well that would explain why straw is what, 3 bucks a bale or something? Interesting — I’m not sure what I’m going to do this year — talk to the guys at my feed store I guess, or go stalking some of those ranchers down valley who have the rotting round bales in their fields. I mulch with straw, too… it tends to sprout the wheat pretty quickly but I just flip the mats over… works great with a thick layer of mulch, but with the thinner not so much. Here’s to an excellent growing season! I’m still laughing about the dog eating chicken poop! When we first got a cow, we tied her out on the front lawn. Of course, she left her fertilizer there. I remember one of our dogs coming up to take a big bite! Ugh!! I do need to remember, it is just grass & hay. Still. Gross! It’s all the horses around that have driven up straw prices.